OLYMPIA—Washington voters support the Legislature authorizing dental therapy this year, according to a statewide poll released today by the Washington Dental Access Campaign. A summary of the poll findings are available below and at http://bit.ly/DentalTherapyPoll. Support was strong in rural, suburban and urban areas. Democrats, Republicans and independent voters all favored the bill by 36- to 39-point margins. For too many Washington families, timely and routine oral health care is out of reach. In 38 of the state’s 39 counties, too few dental professionals are meeting local needs. By authorizing dental therapists, House Bill 1317 will expand dental care access where it is needed most, providing timely, quality care to rural and low-income communities and communities of color and to patients who are publicly insured or uninsured. The bill passed the House Health Care and House Appropriations committees. The bill is not subject to the March 13 House of Origin cutoff, according to designation by the Speaker of the House. Washington voters’ support of dental therapy is a reflection of support for dental therapy nationwide. Guided by national standards adopted by the same agency that sets standards for dentists, dental therapists have been practicing safely and effectively in the United States for 15 years and are authorized or working in eight states, including on Washington’s tribal lands. Under House Bill 1317, dental therapists would be licensed in Washington and held to the same high-quality standards as dentists, but trained to perform a much narrower range of commonly needed procedures. 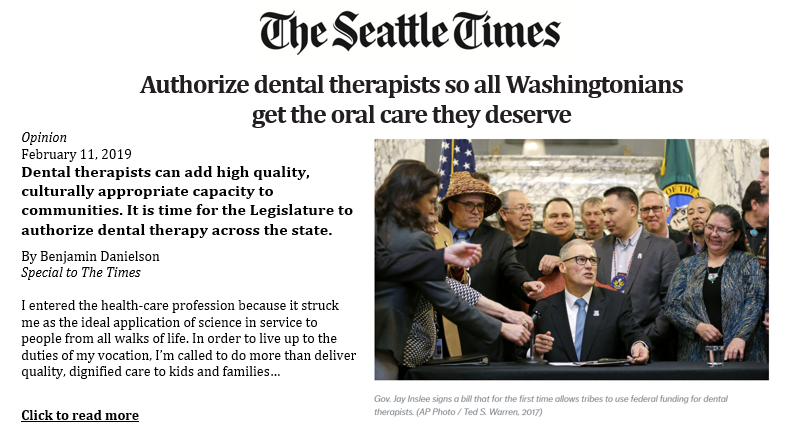 Dental therapists are already working in Washington; the Swinomish Indian Tribal Community licensed their own dental therapist in 2016, and in 2017 state lawmakers authorized dental therapists to work on tribal lands throughout the state. Dental therapists have since been hired by the Port Gamble S’Klallam Tribe and the Lower Elwha Klallam Tribe. Six students from the Confederated Tribes of the Colville Reservation, Lummi Nation, Swinomish Indian Tribal Community, and Tulalip Tribes are studying in Alaska; they will complete their educations and return to serve their communities over the next two years. Dr. Luke E. Adams is dental director at the Seattle Indian Heath Board. “I have met the dental health aide therapists (DHATs) trained in Alaska and I have seen their work,” he said. “I am satisfied that DHATs can deliver safe and effective dental therapy. I am impressed, however, with the variety of innovative practices that DHATs are using to improve public health. Approximately half of Washington kids receive their health coverage from Apple Health for Kids, but only 29 percent of Washington dentists will take their insurance. As a result, nearly 400,000 Washington children covered by Apple Health for Kids do not see a dentist each year. Convened by Children’s Alliance, the Washington Dental Access Campaign unites more than 40 organizations, including health care associations, consumer advocates, dentists, dental hygienists, senior groups, tribal governments and educational institutions to push for statewide dental therapy to address Washington’s oral health care needs. Learn more at www.wadentalaccess.com.